Arthur Henry Hallam was a 19th century English poet who lived a tragically short life. A close friend, the poet Alfred Lord Tennyson, spent 17 years composing a major poem in his honour, simply called In Memoriam A.H.H. Despite such a short life – only 22 years – Hallam made an impact on English literary society and was known as the “fatal young man” of his generation, though some referred to him using the French translation of “jeune homme fatal”. He was born on the 1st February 1811 in London. His father was the historian Henry Hallam and Arthur was sent to public school at Eton where one of his contemporaries was a future Prime Minister – William Ewart Gladstone. 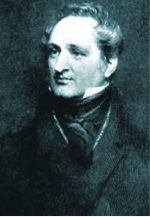 Hallam took a year off to travel with his family when he finished at Eton in 1827 and he found love in Italy in the form of a young English woman who would prove to be the inspiration for a number of his poems. On his return to England Hallam enrolled at Trinity College, Cambridge and here a deep friendship was forged with Tennyson. They wrote poetry together, hoping one day to publish a book jointly but Tennyson’s father objected to this. Hallam was regularly invited to the Tennyson home at holiday times and he fell in love with Tennyson’s sister Emily, the pair soon became engaged. By late 1831 Hallam was writing articles for such publications as Englishman’s Magazine and he was able to offer practical help to his friend Tennyson to enable a second volume of poetry to be published in December 1832. By this time Hallam was employed in the London offices of a conveyancer at Lincoln’s Inn Fields. The following August Hallam and his father set off on another European trip. On arriving in Vienna Arthur became ill, complaining of what he thought was nothing more than a touch of fever. No one saw it as a cause for alarm and it was thought that rest and doses of quinine would soon cure it. However, on the afternoon of Sunday the 15th September Hallam died suddenly while resting on the settee. Doctors deduced that he had suffered from a stroke when a weak blood vessel had burst near his brain, causing instant death. In addition to his major work In Memoriam A.H.H. is believed by many literary critics that Tennyson used the memory of his great friend Henry Hallam to inspire further works such as the famous The Lady of Shalott and a number of others.